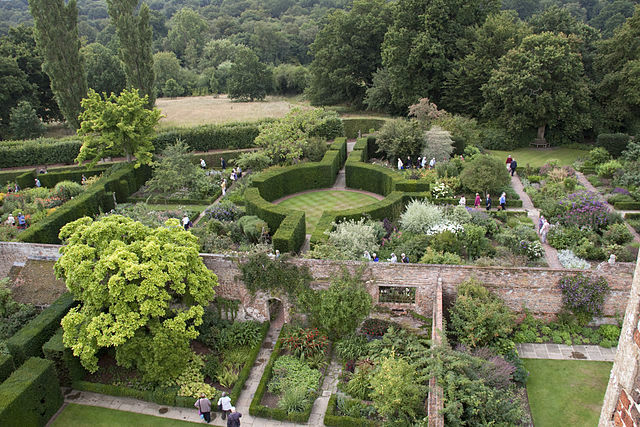 Notes: The garden at Sissinghurst Castle in the Weald of Kent, in England at Sissinghurst village, is owned and maintained by the National Trust. It is among the most famous gardens in England and is grade I listed. The National Trust took over the whole of Sissinghurst, its garden, farm and buildings, in 1967. The garden epitomises the English garden of the mid 20th century. It is now very popular and can be crowded in peak holiday periods. In 2009, BBC Four broadcast an eight part television documentary series called Sissinghurst, describing the house and garden and the attempts by Adam Nicolson and his wife Sarah Raven, who are 'Resident Donors', to restore a form of traditional Wealden agriculture to the Castle Farm. Their plan is to use the land to grow ingredients for lunches in the Sissinghurst restaurant. A fuller version of the story can be found in Nicolson's book, Sissinghurst: An Unfinished History (2008).